Implementing “Just-In-Time” (JIT) operations to cut the time ships spend idling outside ports can help cut emissions. This is good for the environment and can cut costs too. But there are a number of contractual and operational barriers to overcome before this could be implemented worldwide. For some types of ships, such as bulk carriers and tankers, clauses in charterparty contracts currently act as a barrier to the uptake of JIT. For other ship types, such as container ships, contractual barriers do not exist, allowing the ship’s master to reduce speed without breach of contract, thereby enabling JIT to start being implementing today. Focusing on those ship types that can already contractually implement JIT, IMO’s Global Industry Alliance to Support Low Carbon Shipping (GIA) brought together a wide range of industry stakeholders to discuss how to operationally make JIT a global reality. 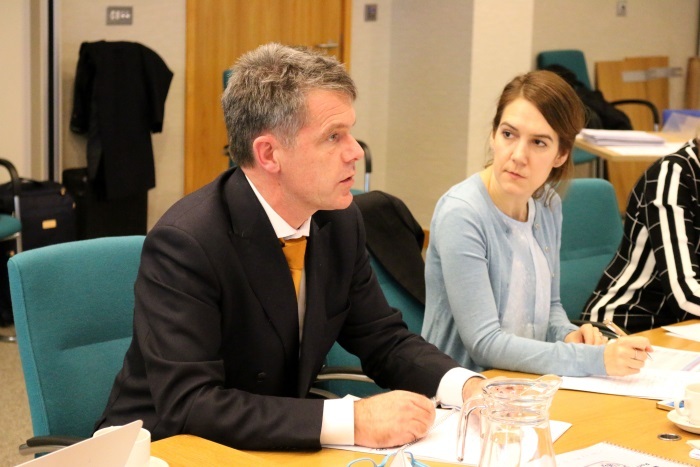 Port of Rotterdam was also present during the roundtable at IMO Headquarters in London (31 January). All representatives from shipping companies, port authorities, terminal operators, service providers (such as ship agents, bunker providers and tug operators) and maritime organizations, discussed in detail how to tackle existing operational barriers. The roundtable identified that for ports be able to provide incoming ships with a reliable berth arrival time, firstly a reliable departure time of the ship at berth needs to be achieved – which involves collaboration of many stakeholders. The ship currently at berth will only depart after loading, unloading, bunkering, provisioning and other critical services have all been completed. However, the terminal and other service providers currently share very few updates about completion times. The roundtable also identified the need for global standardisation and harmonization of data, which is currently being discussed under IMO’s Facilitation Committee, to provide ships with regular updates about the availability of berths, especially in the last twelve hours prior to port arrival. Timing the arrival can allow ships to optimise their speed – such as by slowing down – providing further reduction in the carbon footprint of shipping as well as saving on fuel costs. Additionally, it improves the safety of navigation and rest hour planning of both ship crew and nautical services. GIA members plan to hold another meeting later this year to discuss contractual barriers to JIT. The alliance is also in the process of preparing a real-time JIT pilot trial, in order to test the tangible solutions identified so far and gather experience. The GIA will submit a progress report on its work on JIT to IMO’s Marine Environment Protection Committee (MEPC) with a view to continue supporting IMO member States in tackling emissions from ships and reaching the ambitious emissions targets set out in IMO’s Initial GHG Strategy. The GIA is a public-private partnership initiative of the IMO under the framework of the GEF-UNDP-IMO GloMEEP Project that aims to bring together maritime industry leaders to support an energy efficient and low carbon maritime transport system. The GIA currently has 15 members, representing leading shipowners and operators, classification societies, engine and technology builders and suppliers, big data providers, oil companies and ports.